[miau] Aristocrat is a leader in slot machine development and one of their most popular casino games is Miss Kitty. One is almost guaranteed to find this machine in nearly every casino. The company has decided to test the popularity of this game in the online market. They have kept the basis of the game and the look very similar to the land based version. There are a few differences with some of the symbols, but overall the graphics and the concept are the same. This particular game features fifty paylines giving you an array of ways to win. 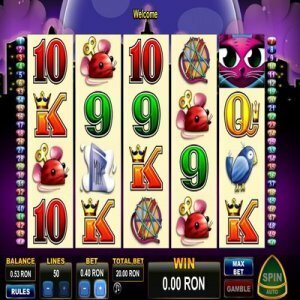 Just like other slot machines, the easiest way to win credits or cash is to get three similar symbols on an active payline. The pay depends on the amount of symbols, the position on the payline and which symbols are displayed in the win. Different symbols lead to different payouts. These symbols include wind up mice, milk cartons, fish and birds. There is also a Miss Kitty wild symbol that appears in reels two through five, but don’t expect to see them too often. The theme of this fun, sophisticated game is obviously a female cat who likes the glamorous lifestyle. Her sparkly necklace and the big city lights are ways one can tell this cat likes the good life. She is the wild symbol in this game and substitutes for all symbols except the moon, which initiates the bonus round. Stacked fish symbols are also apparent within this game. Many reels of stacked fish and Miss Kitty symbols can lead to large payouts. The reason why this game has become so popular is due to the awesome bonus round and sticky wilds. If you see a moon symbol on reels one, two and three the bonus round is initiated. The bonus begins with ten free spins. 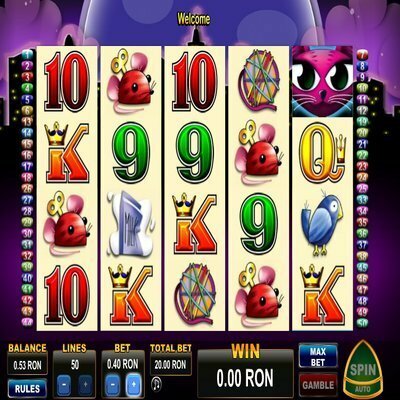 If three moon symbols appear again during the bonus round, the player will be rewarded with more five more free spins. So keep a watch out for those moons. The music changes during this round which makes it even more exciting. It begins with a fun piano intro and then continues through with a catchy tune. The sound you want to hear during the bonus is the meow of Miss Kitty. It will be music to your ears and money in your bank. Every time a Miss Kitty symbol appears, she stays there throughout all of the free spins. So you want to see her very often at the start of the bonus round. This is why they are known as sticky wilds. They stick to the screen and do not move as long as your free spins are playing. So the more sticky Miss Kitty wilds that appear the larger your payout. This is a machine that will lure anyone in with it’s colorful, fun graphics. Miss Kitty tries her best to entice you by giving you a little wink every now and then. It’s an entertaining slot machine, but the bonuses seem to come few and far between. If you are a patient gambler, this machine may be perfect for you. And if you are lucky enough to win the bonus round it is definitely worth the wait.